Sikorsky’s new heavy-lift helicopter in flight testing. 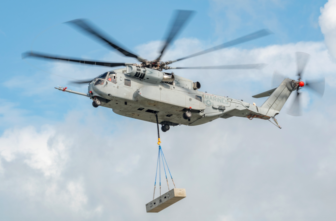 Washington – The Navy on Tuesday moved a critical step toward awarding Sikorsky a contract on the first two huge King Stallion helicopters to be built in Connecticut. But the complete rollout of the program, which is expected to cost at least $25 billion, will be slow. The Navy said it reached “Milestone C,” the production phase of the federal acquisition process, on Tuesday. This allows the Navy to put out a contract for “low-rate initial production,” in this case just two of the behemoth ‘copters, to be built in Stratford. Gov. Dannel Malloy, who negotiated a deal between the state and Lockheed Martin, Sikorsky’s parent company, to keep the helicopter maker in Connecticut, hailed the decision. Malloy’s deal with Lockheed Martin included the guarantee the company would produce the King Stallion in Connecticut in return for $220 million in state financial incentives. Sikorsky also won wage and benefit concessions from Teamsters Local 1150, which represents Sikorsky workers. The entire Connecticut congressional delegation also hailed the Navy’s decision to go forward. “This milestone marks the official transition from development to production of the CH-53K – the most powerful helicopter ever to be built,” the delegation said in a joint press release. Besides being the most powerful helicopter the Pentagon owns, the King Stallion will be the most expensive, with an estimated cost of at least $130 million each. Sikorsky began building CH53 heavy-lift helicopters in the early 1960s. But those fleets are aging and in need of replacement. The King Stallion program has been plagued by delays. The first test flight, initially expected in 2014, was made in October of 2015 because of technical issues, mainly with the helicopter’s main gearbox. That problem has been fixed. The Navy, which has been in negotiations with Sikorsky over the price of the King Stallion, had hoped to reach Milestone C in February. Four prototypes were built and tested at Sikorsky’s plant in West Palm Beach, Fla.